The health center model is unique. Community Health Centers offer patients and the community a seat at the table through a board that’s majority—at least 51 percent— patients served by the health center. But it isn’t just the board that represents the local population, often times the health center’s staff does too. It’s this community-focused design that propelled some health centers to go above and beyond to help following the catastrophic Hurricane Maria. It soon became clear to Fair Haven that for many people the only option they had was to get off the island, and with the large Puerto Rican population in their community many evacuees would be arriving soon. But that realization led to questions about how the health center could best offer support. “We went through a rapid process to figure out how to support our community and very quickly settled on sticking with what we’re good at, which is health care,” said Niess. The health center quickly surveyed staff about the needs of friends and family dealing with the disaster, which highlighted concerns around the interruption of medical care, housing, employment, food insecurity and, with winter just around the corner, finding cold weather clothing for new arrivals. With clinicians leading the way, Fair Haven piloted a multidisciplinary clinic within a month. At its core was the idea that patients would walk in and immediately be screened for behavioral health and social services needs, and then be routed to ongoing care. “They would see all three department providers in one visit, which was really a novel workflow for us,” adds Niess. 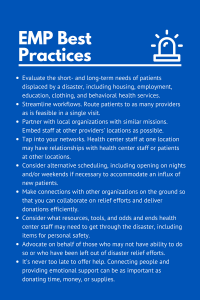 It’s no secret that health centers typically operate at capacity because their mission is to provide health care access to all. 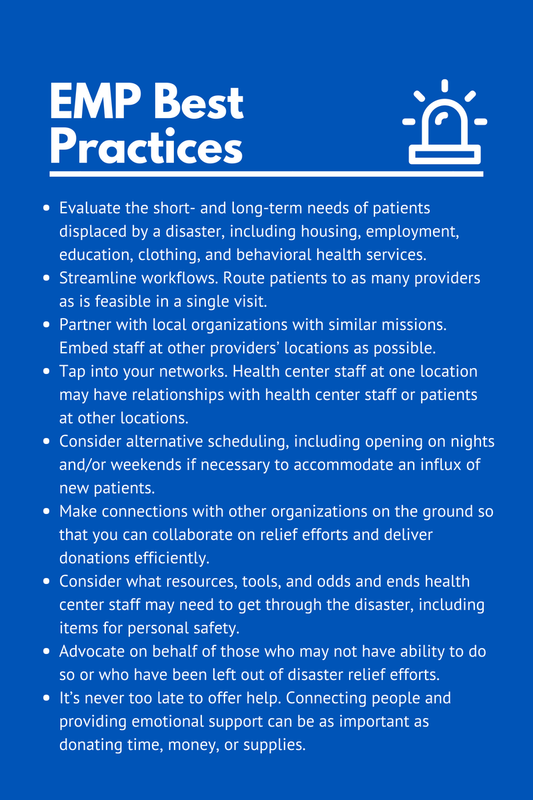 It’s not unusual for health centers to offer extended hours and multiple social services to meet their mission. The new patients, the complexity of their care needs, and the changes in workflow, coupled with the arrival of new family members who would need assistance to get situated in Connecticut, could have resulted in a worn out staff. However, that was not the case. According to Niess, a combination of providers and behavioral health staff took the lead in facilitating staff support events, like providing lunch. They also made time to check in with people and survey how everyone was doing. “It was a small token given the weight of what everyone was carrying around, but I think just creating a space in a busy clinic like this really meant a lot to people,” she added. Fair Haven’s leadership was also supportive of their providers’ efforts to help. They took the lead in partnering with local organizations who were also rendering services to evacuees. The health center worked with Junta, an organization that provides services, programs and advocacy to the local Latino community. Evacuees were referred to Junta when they arrived in the community, and it quickly became the epicenter for this massive relief effort. Niess says that working with these patients—particularly dedicating a full day a week to seeing evacuees—allowed them to learn more about available resources for this type of situation. That knowledge meant they could focus on providing better care to these patients. Holyoke Health, a health center in Holyoke, Massachusetts, serves and employs a predominately Puerto Rican population. After Hurricane Maria devastated Puerto Rico, Holyoke’s community was anxiously awaiting information about loved ones on the island. It didn’t take long for Holyoke leadership to step in to support staff. Recognizing the connection between health centers in the U.S. and Puerto Rico, Holyoke reached out to health centers in Puerto Rico and asked them to look in on or find information on employees’ loved ones. It just so happened that in a lot of cases the family members in Puerto Rico were patients of health centers on the island. This realization made the staff’s connection to their employer and health centers stronger. While the staff was working in a health center, their family thousands of miles away were patients at a health center, and these centers were all connected through the network of health centers that spans the country and the U.S. territories. Holyoke’s support of the Puerto Rican community extended beyond making connections. Leadership was able to secure the donation of a private jet and a team from Holyoke, including Breines, made multiple trips down to Puerto Rico within weeks of the hurricane. They flew from Holyoke to Aguadilla on the northwest tip of Puerto Rico with medical supplies, water, personal messages of support and other essential items. These items were then distributed to health centers in Rincon, Cidra, Humacao, and other communities. On those trips the plane would also return to the U.S. with patients. 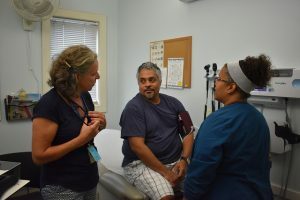 In total, including those evacuees that made it to Holyoke by other means, the health center enrolled about 650 new patients into its practice. These new patients needed much more than just health care. They required help resettling into the area. Holyoke took on locally connecting families, holding clothing drives, food drives, and working with local resource and sheltering centers. As evacuees began to realize that their stay in Massachusetts was more permanent, Holyoke’s efforts shifted to include helping with job training, housing and enrolling children in school. Like Fair Haven, Holyoke also worked with a local organization to meet the needs of newly arrived patients. They partnered with Enlace, whose mission is to develop, lead and promote organizing in Holyoke. As evacuees arrived, Enlace became a welcome center within the community. Holyoke permanently placed some of their staff at Enlace and helped coordinate an orientation process that happened every day at noon and offered new arrivals information from 5 to 10 agencies they needed to know. Absorbing 650 new patients was no small task but the health center staff stepped up. They agreed to work additional clinic hours and the health center was able to open up evening hours to accommodate the volume without imposing on existing patients. The staff was willing to do whatever they could to be a part of the process and help. Breines says morale was lifted by the pride staff took in helping these patients. ”I’ve been here for 24 years and I think this is the most I’ve been appreciated by my own staff,” Jay says laughing and describing the messages of thanks he gets in the hallways these days. There is still anxiety among the community and staff that something similar to Maria could happen again. But staff know that Holyoke will immediately be a resource for help. Last September, the San Benito Health Foundation, located in Hollister, CA, was offering assistance to Mexico City after it was struck by a 7.1 magnitude earthquake when they were alerted to the catastrophic scene in Puerto Rico. It was immediately obvious to San Benito that communication was going to be a challenge, so they began to think about how they could help establish communication channels. They turned to satellite and solar technology, purchasing satellite phones and solar chargers. Fernández then set to making connections with her contacts on the island and standing by for a flight. As a native of Puerto Rico, the CEO was very familiar with the island’s communities, and through her connections, including Direct Relief and a previous match fellow, she was able to maneuver around the island to visit health centers and provide supplies. “I was particularly concerned with the clinics in the west, which were the last to come on board in terms of communication,” says Fernández. Fernández and her team visited a total of eight clinics, offering much-needed supplies. She had suitcases full of essentials that might be helpful including batteries, which were difficult to get on the island. “A lot of it was assessing what were those immediate needs and some were little things that people needed just for their own security,” she says. Fernández also tearfully recounts that what providers needed most in the chaos was to feel connected and to be heard. The CEO says she learned the importance of connections and knowing who to call to help funnel donations to those in need in a more effective and efficient manner. She also stressed the need to be a voice for those who cannot advocate for themselves. According to the CEO, feeling a connection and comradery to people not living the storm recovery experience is important to the staff’s mental health.